Black powder coated finish resists fingerprints. 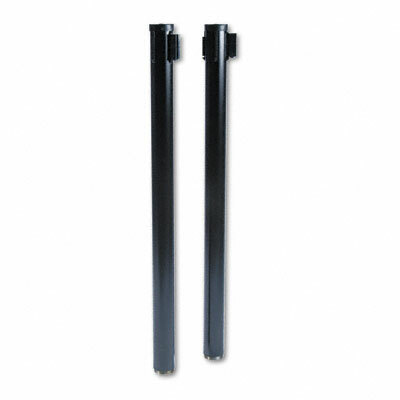 2" webbed tape is housed in post head, extends up to 7 ft.
and retracts slowly and safely. Heavy-gauge steel construction provides maximum strength. Built-in, three-way adapter for tape attachment. Posts and bases shipped two per box. Black powder coated finish resists fingerprints. 2" webbed tape is housed in post head, extends up to 7 ft. and retracts slowly and safely. Heavy-gauge steel construction provides maximum strength. Scuffproof base cover. Built-in, three-way adapter for tape attachment. Posts and bases shipped two per box.